Installing a faster Intel processor is one of the most effective ways of improving the performance of a computer. The processor is a microchip that handles instructions and commands. It processes this information and the faster it can do this means the quicker and smoother the computer will perform and the more complex tasks it can carry out. Intel are always pushing the boundaries of technology so their processors are continuously improving and evolving. 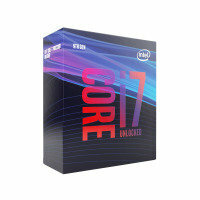 Fortunately Ebuyer.com always stocks the very latest Intel processors so you are always able to improve the performance of your machine with the highest specification processors. And since new processors are more efficient than the devices they are replacing, this generally means that a computer will run cooler and be more energy efficient. There is a huge range of Intel processors including i5, i7 and quad core here at Ebuyer.com and all are available on great deals with low prices. Check out the full selection or use the filter features on the left to search by processor speed and core.